It might be best to stay out of Margot Robbie’s way when she’s in character. She may not have known at first that her character, Tonya Harding, was a real person, but while on set — as she told the audience after the Toronto Film Festival premiere of I, Tonya — sometimes she got so into playing Harding that she forgot she wasn’t actually in a volatile, violent relationship with Sebastian Stan’s Jeff Gillooly. Something tells us that Sebastian Stan and the side of his head might feel a little bit differently about their favorite moment in the movie. Check out various snippets below from a variety of reviews of I, Tonya after it’s debut at the 2017 Toronto International Film Festival. Variety: Part of the film’s drama — almost its morality — is that Tonya, though a highly successful skater who starts to compete in national championships, gets lower scores than she deserves, and the judges, at several points, come out and admit that it’s about factors besides skating — what they call “presentation.” But that’s just code for conventionality, for wanting to sell a homogenized image of America on the Olympics level. It has nothing to do with what any of this is supposed to be about — skating — and that lends Tonya a streak of rebel realness. The Wrap: As a whole the film delights in and demands audience participation by breaking the fourth wall often. Robbie brings a brand of vinegar we haven’t seen in her previous work, and it illuminates a long-forgotten trainwreck. It’s an Avengers reunion: Samuel L. Jackson has signed on to join Sebastian Stan in The Last Full Measure. Christopher Plummer, William Hurt, Bradley Whitford, Michael Imperioli and Linus Roache also star in the film from Todd Robinson (White Squall, Lonely Hearts). Based on the true story of a present-day cover-up investigation, The Last Full Measure follows young Pentagon investigator Scott Huffman (Stan) as he battles the political machine in Washington. He reluctantly teams with veterans of Operation Abilene to convince Congress to award the Medal of Honor to a courageous Air Force medic, William Pitsenbarger, who is seen saving the lives of more than 60 Marines who were ambushed in one of the bloodiest battles of the Vietnam War. As the battle waged on, and after the last helicopter left, he continued to save lives until his own was sacrificed. Foresight Unlimited is handling international sales and producing in association with Provocator and SSS Entertainment. Timothy Scott Bogart, Mark Damon, Lauren Selig, Julian Adams, Nicholas Cafritz, Robert Reed Peterson and Shaun Sanghani are producing, with Tamara Birkemoe, Jenna Sanz-Agero, Sidney Sherman, Louis Steyn and T.J. Steyn executive producing. Pen Densham and John Watson are co-executive producers. Principal photography is set to begin later this month in Atlanta and Costa Rica. “When I read Todd Robinson’s exceptionally moving script and heard the real-life interviews of the many men whom William Pitsenbarger saved, I felt this could be a great film. With the award-winning cast that has been assembled, I am now sure of it,” said Foresight Unlimited’s Mark Damon. Stan is currently in production on Avengers: Infinity War for Marvel Studios/Disney and I, Tonya starring Margot Robbie, and has wrapped work on Steven Soderbergh’s Logan Lucky. He is repped by ICM Partners and Brookside Artist Management. Jackson will soon be seen in Legendary’s Kong: Skull Island, which Warner Bros. is releasing on Friday, and The Hitman’s Bodyguard for Lionsgate in August. He recently wrapped Brie Larson’s directorial debut Unicorn Store. Jackson is repped by ICM Partners and Anonymous Content. Plummer can next be seen in The Exception for A24 and The Man Who Invented Christmas for Bleecker Street in December. Hurt can currently be seen on the Amazon series Goliath opposite Billy Bob Thornton and will next be seen in Live Like Line opposite Helen Hunt. Whitford is in postproduction on Unicorn Store and Three Christs starring Richard Gere; he previously starred in HBO’s All the Way and can currently be seen in the Universal hit Get Out. He’s repped by ICM Partners and Greenlight Management and Production. Imperioli most recently starred on Fox’s Lucifer, and Roache on History’s Vikings and in Netflix’s Barry. “Captain America: Civil War” actor Sebastian Stan has joined the cast of the Tonya Harding biopic “I, Tonya” starring Margot Robbie as the figure skater. Miramax recently landed the rights to distribute the film. Craig Gillespie is directing. Robbie, who broke out in “Suicide Squad” this summer, will also produce along with Tom Ackerley through their Lucky Chap production company with Bryan Unkeless and Steven Rogers, who also wrote the screenplay. Len Blavatnik and Aviv Giladi will executive produce for AI Film, which is financing the project. AI came on to the project in October. Stan will play Jeff Gillooly, the estranged husband of Harding, who helped plot the attack on rival figure skater Nancy Kerrigan. Gillooly later revealed he and Harding’s bodyguard Shawn Eckhardt hired Shane Stant to break Kerrigan’s leg so she couldn’t compete in the upcoming 1994 Winter Olympics in Lillehammer. Besides reprising his role as the Winter Soldier in “Captain America: Civil War,” Stan also has the Steven Soderbergh heist movie “Logan Lucky” coming out next year. Stan is repped by ICM Partners and Brookside Artist Management. Deadline Hollywood first reported the news. 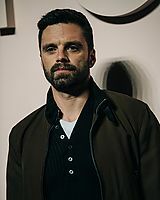 “I’m haunted by that movie Birdman,” Sebastian Stan tells me as we sit in a hotel room at the Los Angeles Four Seasons while the press day for Captain America: Civil War unfolds around us. Based on the number of men and women with headsets stationed near doors, you’d think there was a head of state in town — and really, how far off is that comparison? The Avengers actors aren’t running any nations, but they do represent Disney’s flagship franchise, one so elaborate they had to invent a term for it: a cinematic universe. By the time Civil War leaves theaters, this universe will have made Disney $10 billion worldwide; knowing that, the pomp and circumstance doesn’t seem so overblown. Stan, who plays Bucky Barnes, a.k.a. the Winter Soldier — namesake of the second Captain America movie and an even bigger part of this new one — is clearly trying to wrap his head around this superhero life. Thus, the reference to Birdman: a movie about an actor attempting to erase the memories of his superhero alter ego by staging a serious play; a movie in which an actor’s superhero alter ego follows him like a ghost, reminding him it’s the hero people want to see, not the washed-up actor and his play; a movie that exists as a rebuke to the tights-clad tentpoles that have taken over the industry. This seems like a matter for a licensed therapist, not one of the revolving door of journalists coming through press day. Is Stan worried that his alter ego, the Winter Soldier, will overtake Sebastian Stan, the actor? As Captain America’s best friend Bucky – and as the subsequently brainwashed-by-the-Soviets-to-be-an-assassin-Winter Soldier – Sebastian Stan has been a key character in what is now an iconic trilogy. With the third installment, Civil War, he is a primary cause of the, uh, civil war, led on opposite sides by Iron Man and the red, white and blue Avenger. “The appeal is simple,” Stan said at a recent Marvel press event. “It’s a challenge. “Every scene the Russos [Joe and Anthony, the film’s directors] and I would get together and go, ‘Where is he now? Does he remember this? Does he not? Did he remember that he might have committed that crime or not? So there’s a lot of fun questions with how to play it. Stan’s Bucky is in fights with at least 10 characters during the course of the film and he says it was a challenge with the Russos to make each fight distinctive. “It’s like a dance,” Stan said. Plus, “we just had an amazing stunt team. These guys come from places like Ip Man and The Raid and all those awesome Asian films. So, it’s just a lot of repetition over and over. Stan said there was additional excitement in the stunt work because he wasn’t wearing a mask. a child, Sebastian Stan occupied more countries than most people do houses. At the age of 8, he moved from his native Romania to Vienna, and then, four years later, to New York. Now 33, Stan doesn’t think all that dislocation was always healthy. But it may have given him a certain psychological edge in understanding characters who slip from one guise to another. 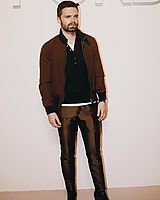 Stan is decidedly a man caught between two worlds in Anthony and Joe Russo’s “Captain America: Civil War.” The new and well-reviewed superhero movie, which begins its U.S. run Thursday night after a massive opening overseas, has Stan revisiting his role as James “Bucky” Barnes, a.k.a “The Winter Solider.” As viewers of the erstwhile film named for him know (and the first “Captain America” before that), Barnes was a respected U.S. military man — and childhood friend of Steve Rogers (Chris Evans) — later brainwashed into working for the Soviets as a kind of human instrument of torture, before (possibly) remembering his roots and seeking redemption. As viewers of the new film soon learn, Barnes will continue to evolve, as will the significance of his role in the Marvel Cinematic Universe. The character in “Civil War” becomes, owing to past actions, a key fillip in the tension between emerging rivals Iron Man/Tony Stark (Robert Downey Jr.) and Rogers’ Captain America. He is, in a real sense, the pivot point around which all the action revolves. As Stan eats a burger at a restaurant near his downtown Manhattan apartment on a recent Friday afternoon, he shows little of the prepossession of a man whose actions are about to viewed and scrutinized by hundreds of millions of people around the world. His long hair hangs straight to his chin, a ballcap sits in his hand and his face wears the kind of stubble that is neither shadow nor beard. A pair of designer-casual shoes are the only hint of someone with a more upscale day job. Let’s say you’re playing an American soldier with severe post-traumatic stress disorder struggling to assimilate back into society. For the last several decades you’ve also been forcibly brainwashed to forget compassion and embrace violence to the point of desensitization, but memories of your old life as a decent man begin to emerge. Sounds like a juicy role for an actor, right? These are the challenges facing Sebastian Stan in “Captain America: Civil War,” the newest comic-to-big-screen installment from Marvel Studios. Don’t be fooled by the whiz-bang action sequences and glossy production values of such blockbusters; actors playing superheroes must flex their acting muscles as much as those in prestige dramas—not to mention their literal muscles, too. “When I go to work I don’t discriminate it as a comic-book movie,” says Stan over coffee at Manhattan’s the Gander. “It’s full-on commitment. 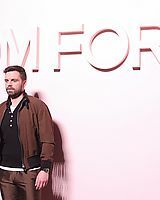 That’s all you can do.” Stan and his Marvel Cinematic Universe co-stars, who include such awards season heavyweights as Mark Ruffalo, Tilda Swinton, and Michael Douglas, are using sheer talent to elevate the ostensibly lowbrow genre. He’s the indomitable Bucky Barnes, who told a pre-warhero Steve Rogers that, “I’m with you till the end of the line”. He wasn’t kidding. “Yeah, I love having beers with all the guys, Anthony Mackie (the Falcon) and Chris Evans included. I’m still really close friends with all the people I’ve worked with,” he tells me. Here. the Romanian born New Yorker answers 7 questions for us. From Gossip Girl to Winter Soldier, what was your actor’s process? And do you have a ritual that always helps you get into character? I used to smoke a lot. And I had this ritual, where I’d show up for the audition, have a cigarette, and keep the stub until I heard whether or not I got the job. Now its a lot of meditation, music, I’m a bit music guy and I like to create my own playlists. Anything that helps get your concentration in order. What’s your dream crew? As in directors, writers, or actors you’d like to work with. I love Aaron Aronofsky. Hey, can I send him a personal letter through you? (sure, go ahead I reply.) Aaron, you’re the only man who can wear a mustache well. Please call me, I’d love to grab lunch or see a movie together. Talk to you soon (Stan laughs, because, and you can tell, he’s half serious). Other than that, Ridley Scott, Martin Scorcese, Ron Howard, amazing guys like that. Directors are important, movies are ultimately a directors medium. It’s their world, not so much an actors world. End of the day, it’s their vision. On a scale of one to ten, how lucky are you in life? Oh wow, I’m very, very lucky to do what I do. In fact I’m going to get a chance to travel to Malaysia soon for work. Everyday, I make a gratitude list of 10 things that I’m grateful for. (I’m incredulous so I reconfirm that anecdote) Yes, I do! I really think I’m really lucky. I’m so grateful for my family, my mom, my stepdad, they all made it possible for me to come here. Plus the opportunities I’ve had, for my friends, for the fact that I’m living in New York, in my own apartment in the city. I’m also grateful to have people that believe in me the way they do; my manager has been with me 17 years, my agent for 15 years. It’s also a friendly reminder that life is has got to keep going, you should never feel like you’ve arrived. You gotta stay hungry. It’s all over for you the moment you don’t. And in my job, it’s also about exploring yourself. Films are an incredible medium where you get to talk to people. I have these great fans, they write me everyday, telling me about their lives getting better from watching my movies. To me that’s more important than anything else. And as a man in the world, you have to leave something behind, if not what the hell am I doing while I’m here? Okay, time for some fun questions. What kind of music gets you dancing when no one’s looking? Haha… My favourite is 80’s music. There’s this one singer called Tiffany, her song was I Think we’re Alone Now. Who would you want to be marooned on a tropical island with? How would the friends you grew up with describe you? I hope – and this is a big one – that they say I’m loyal, driven and direct. Who’s your favourite Disney princess and why. Oh man… I think Princess Jasmine, from Aladdin? She’s just great and such a strong character that just stuck in my mind. A war movie? An action thriller? A super-powered face-off for the ages? However you’ve heard Captain America: Civil War described, you’ve probably only heard it called a love story in semi-jest. But that’s exactly how director Joe Russo termed it when Empire caught up with him on set. 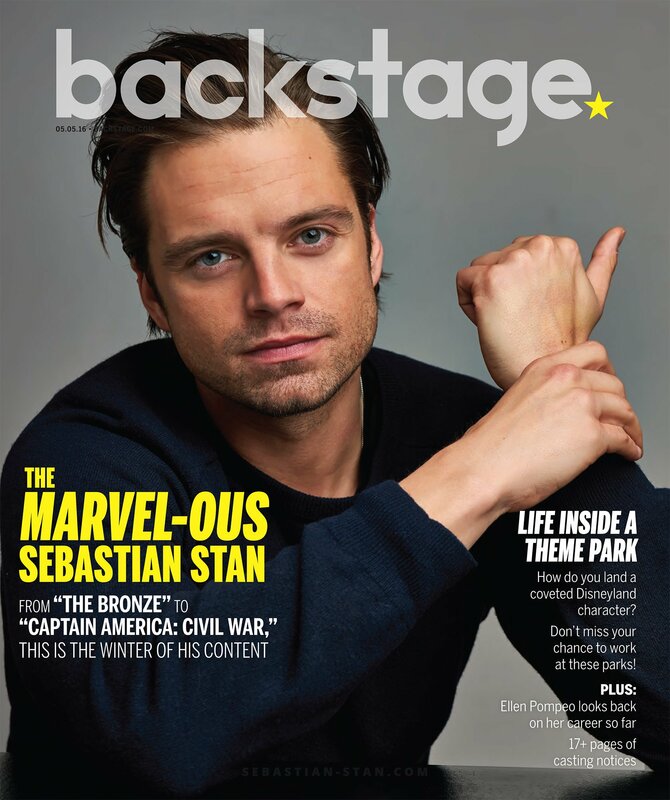 Bucky himself, Sebastian Stan, dials back a little on the love talk – hey, it’s not like that fan fiction needs help writing itself – instead likening the pair’s relationship to the Bad Boys movies’ Will Smith/Martin Lawrence dynamic. “I think it’s easy and generalising it to say that they’re lovers, when you’re forgetting that one has a lot of guilt because he swore to be the protector of the other, the father figure or older brother so to speak, and then left him behind.” Adds the actor: “I have no qualms with it but I think people like to see it much more as a love story than it actually is. It’s brotherhood to me.” Science Bros, eat your hearts out. One thing that is clear is that Cap’s loyalty to his old friend, now compromised by that whole Winter Soldier thing, fuels the breakdown of another, more brittle friendship. Tony Stark is, as the movie’s most recent trailer shows, is a foe to be reckoned with. Joe and Anthony Russo are directing this one, from a script by Christopher Markus and Stephen McFeely. It stars (deep breath): Chris Evans, Robert Downey Jr., Scarlett Johansson, Anthony Mackie, Emily VanCamp, Don Cheadle, Jeremy Renner, Chadwick Boseman, Paul Bettany, Elizabeth Olsen, Paul Rudd, Frank Grillo, Tom Holland, William Hurt, and Daniel Brühl. Captain America: Civil War lands in the UK on from April 29, and US cinemas from May 6.